Bachelet, who as President of Chile maintained warm diplomatic relations with the Maduro regime, highlighted the “dramatically deteriorating economic and social rights” of Venezuelan citizens, amid a time of political and economic crisis that has left millions of people in need of humanitarian assistance. In a statement Wednesday, Bachelet confirmed her office had sent human rights observers into Venezuela to investigate reports of “possible extrajudicial executions” by regime security forces against political dissidents. “I am also concerned about increasing restrictions on freedom of expression and of the press in Venezuela, and the allegations that the authorities have arbitrarily used the law against hatred, adopted in November 2017, to prosecute journalists, opposition leaders and anyone expressing dissenting opinions,” she continued. #Venezuela: I am deeply concerned by the magnitude and gravity of the #HumanRights impact of the current crisis, which is also a worrying destabilizing factor in the region. 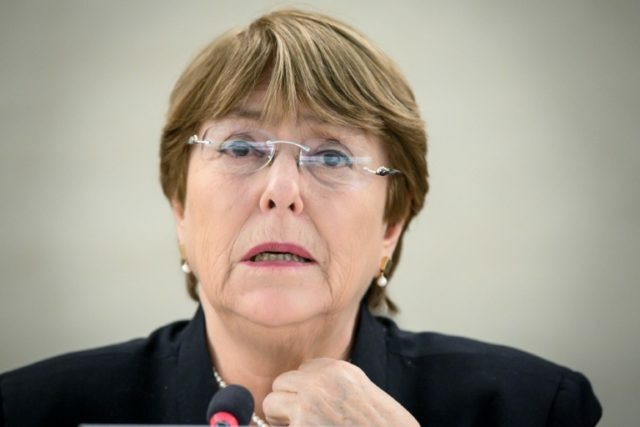 – UN Human Rights Chief @mbachelet updates #HRC40. However, Bachelet also criticized sanctions imposed by the United States targeting the Maduro regime’s access to financial resources, arguing that they are also hurting the Venezuelan people. Nearly three million people have fled the country since 2015, placing extra pressure on neighboring Latin American countries such as Colombia and Brazil. “I am concerned that the recent sanctions on financial transfers related to the sale of Venezuelan oil within the United States may contribute to aggravating the economic crisis, with possible repercussions on people’s basic rights and wellbeing,” she said. Deputy Assistant Secretary of State for Western Hemisphere Affairs Carrie Filipetti said that the sanctions were not intended to harm the Venezuelan people but instead an attempt to instigate a democratic transition in the crisis-stricken country. “We have tried to target our sanctions as much as possible so that it can affect the regime but leave the individual Venezuelans as untouched as possible,” she told reporters. Sanctions imposed so far have targeted state-run industries such as oil and gold mining, although President Donald Trump warned earlier this week that they could get a “lot tougher” in the weeks to come.